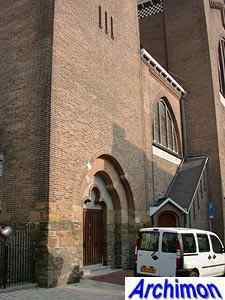 Before the current church was built, there had been two previous churches at this location. Little is known about the first one, and only slightly more about the second. 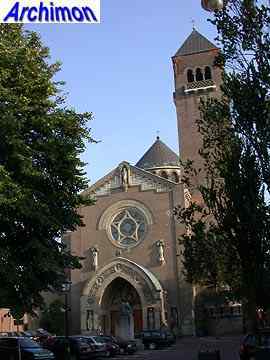 This second church incorporated the choir of the first one and was built in 1844. 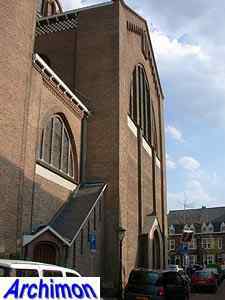 It was a neo-Classical church, designed by A. van Veggel. Unusual for its time, it had a centralizing ground-plan. 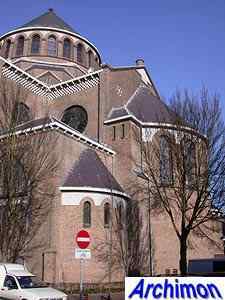 The crossing was covered by a big octagonal dome. 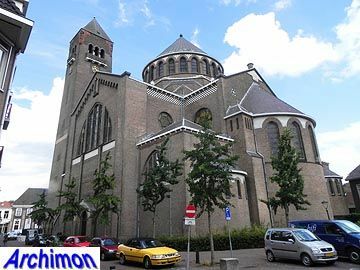 This church was demolished in 1905, when the construction of a successor was commissioned to architects Jos Cuypers and Jan Stuyt. 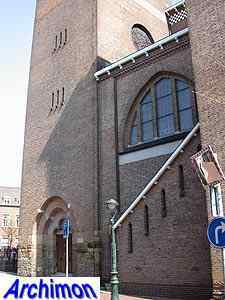 Because the plot of land was surrounded by buildings on all of its sides and was almost square in shape , the idea for a centralizing church became obvious. 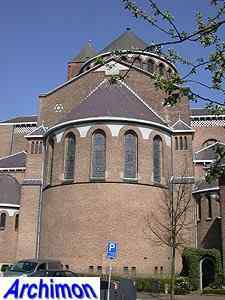 Offically, the church was designed by both architects. 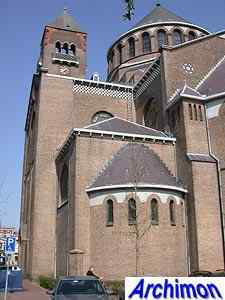 But like the earlier church of St. Antonius in Utrecht, this one seems a work of Stuyt mostly. Its design is clearly inspired by Italian, Byzantine and Romanesque architecture. 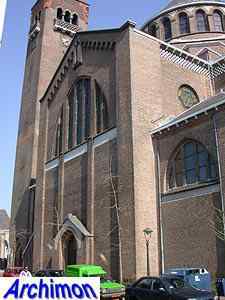 Cuypers' churches at that time were still mostly in neo-Gothic style, although he possibly designed the portal. 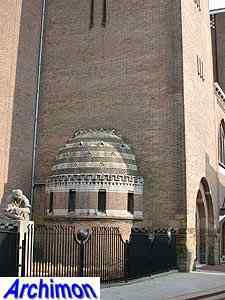 Distinct features of this church are the square, slightly tapered Italian campanila-style tower and the chessboard decorations, typical for many of Jan Stuyt's churches. 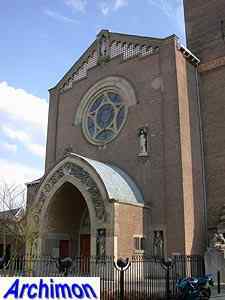 The church is an early example of the increasing tendency of centralization in the work of the two architects. 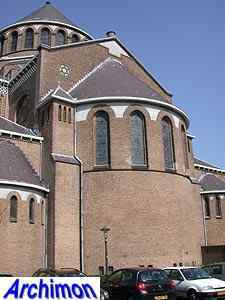 It already has a centralizing dome at its crossing without being a real dome-church like some churches these architects would design later. Drawings of the church indicate that the church was at first meant to be oriented. Instead, the choir is at the south instead of the east side. 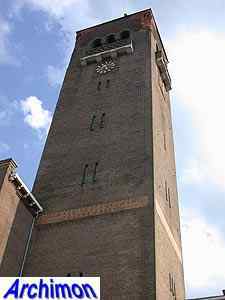 The tower was completed in 1923-1924 and originally was planned to be taller. 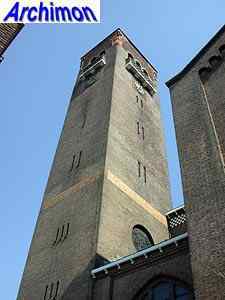 In fact, it would have been taller than the tower of St. Jan's cathedral, which was not acceptable for the diocese. 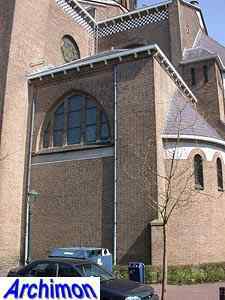 What is now the front of the church until 1928 was a blind wall, but in that year a portal was added. 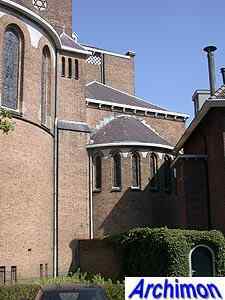 The houses in front of the church had previously been demolished to form a square. 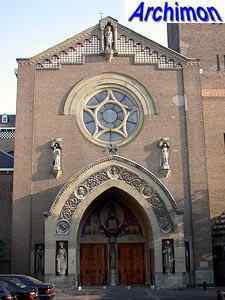 In 2002 the church was closed for services. 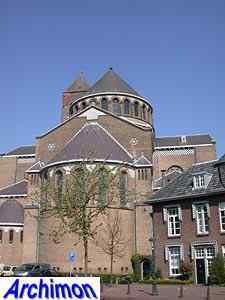 After several internal changes, it reopened in 2007 as the Jheronimus Bosch Art Center.